In the last two posts I have tried to show that there is a benefit to running an occasional calibration test on equipment, to ensure that it is giving the best performance. This does not mean that the nozzle needs to be tested every day, although some of the cheaper pressure washer nozzles, for example, will wear out in less than an hour. An operator will learn, over time, about how long a nozzle will last, and can, after a while, tell when it is starting to lose performance. But in working on a number of different jobs in succession that sense of the performance may be missed, and it can be handy to have a standard target that a jet can be pointed at that it should be able to cut in a known time. One simple target is plywood, and, to continue the saga of nozzle comparisons through a slightly different approach, Mike Woodward used plywood sheets to compare different nozzles in one of the earliest comparisons of performance. We since duplicated his test equipment and ran tests with a more modern selection of nozzles, but the basic results and conclusions remain the same. In its simplest form the idea is to build a holding frame that will hold small squares of plywood at fixed distances from the nozzle. In the frame shown below the plywood pieces are set at one-foot distances apart, with the nozzle held at a fixed point at the end of the test frame. 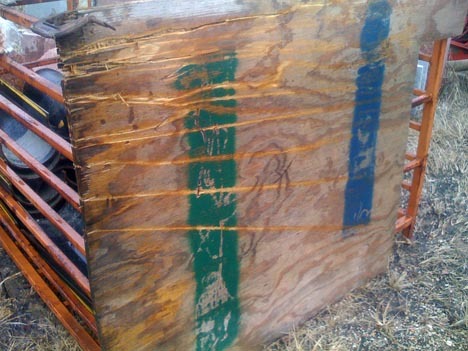 Tests showed that it takes around 2,700 psi to cut through the plywood. The initial tests that Dr. Woodward ran were run on nozzles that were run at 10,000 psi with a nominal flow rate of 10 gpm. The nozzles that were used cost in the range from $10.00 to $250 apiece. (And these costs were reported in 1985 at the 3rd American Waterjet Conference). Tests such as this are simple to run. Plywood pieces are set into the frame, the nozzle is placed at the end of the frame, and the jet run for ten seconds. Over that time, the jet will cut through any of the pieces of plywood that it reaches with enough power to cut through, and generally the jet will punch a hole through several pieces. Figure 2. The different designs of nozzle that Mike Woodward tested in 1985. The profiles show that there was only one of the common nozzles at the time that fitted smoothly onto the end of the feed pipe. In the other cases there is a small gap between the nozzle piece and the feed tube, so that turbulence would be generated just as water entered the acceleration section of the nozzle. The hole size in each plate was then measured, and that width plotted as a function of the distance from the nozzle, so that a profile of the jet cutting path could then be drawn. Figure 3. Profiles cut into the different pieces of wood, showing the cutting power of the different jets, as a function of distance and the actual amount of water flow as measured. As an additional part of the testing a rough measure was kept of the effective nozzle life Some other performance parameters for the different nozzles can be put into a table. Figure 4. Performance of the different nozzles. Clearly just going out and buying the most expensive nozzle on the block is not necessarily the best idea. But it also depends on the use to which the nozzle is going to be applied. There are two different applications, that of cleaning a surface, and that of cutting into it. 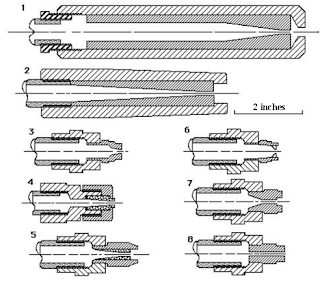 The broader path achieved by nozzle 1, for example, which also removed the largest volume of wood per horsepower, makes it a good selection for cleaning, and for reaching further from the nozzle, as would be needed if one were cleaning the pipes of a heat exchanger bundle. On the other hand the more coherent flow through nozzle 2, which gave a narrower cut might be a more effective tool in a cutting operation. In other cleaning operations where the nozzle is being operated very close to the surface, then nozzle 3, which has a wider path, might be a better choice, though that is lost if the target surface is further away. And though there was not a great deal of difference in performance between nozzles 1 and 5, there is a considerable difference in price. A smaller, lighter nozzle may be a beneficial trade-off if the nozzle body is fitting on the end of a lance that will be operated manually for several hours at a time. There is an alternate way of using plywood as a target that I have also used in teaching class. The student is using a manually operated high-pressure cleaning gun at 10,000 psi and is to swing the gun horizontally so that the jet cuts into a piece of plywood that is set almost parallel with the jet path, but with the stream hitting the wood from the side initially further from the operator, but as the swing completes the jet cuts up where the nozzle almost touches it and then sweeps on past. The result is that, over the distance that the jet can cut into the wood, a groove is carved into the wood. Figure 5. 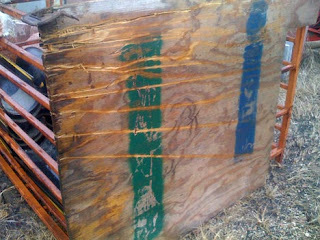 Horizontal cuts into plywood. There were about half-a-dozen students who had swiped the nozzle so that it just cleared the left edge of this 4-ft wide piece of plywood, and you may note that the cuts extend roughly ¾ of the way along the surface. Once the students had seen this cut, I would ask them how far away they thought, based on that measurement, that the jet would cut into a person. Typically they said about three feet, and then, as a precaution, I suggested they add a foot or so more. 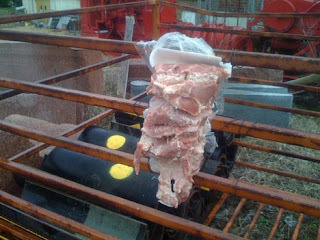 Then I took them over to a metal frame where we had hung a piece of pork. We carefully measured off the “safe” distance from the end of the nozzle to the pork. Figure 6. Piece of pork that has been traversed by a 10,000 psi jet several times, with a typical standoff distance from the nozzle of more than four feet. Invariably we got the result shown in Figure 6. The jet would cut into the meat to a typical depth of around two inches and groove the underlying bone. It was a salutary way of getting their attention about the safe use of the tool, and I noticed that the staff also got a bit more cautious after we ran this class every year.